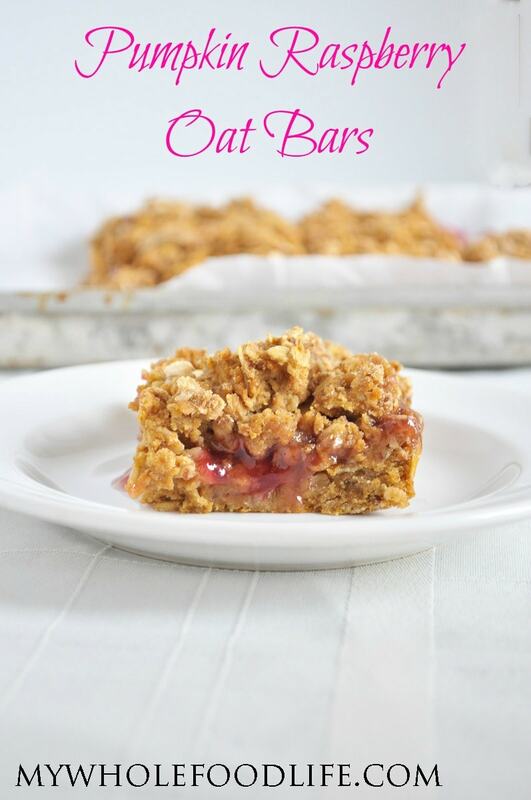 Pumpkin Raspberry Oat Bars. Wow these are so good! The other day, I came across this recipe in the Facebook recipe group I run. The original recipe has much more oil than I typically use. It’s also not gluten free. So I made my Pumpkin Raspberry Oat Bars gluten free with 1/4 of the oil. I also changed a few other things. The recipe came out fabulous! You can custom create your own flavors by changing up the jam. I used some raspberry chia jam for my filling, but any jam would do well. Once again this is a recipe I used sorghum flour in. I like it’s cakey texture and I thought oat flour with rolled oats might be too much oat flavor. Feel free to use gluten free oat flour if you like. I am sure it will work great too. These bars are gluten free and vegan. If you are not a fan of pumpkin, you could probably use sweet potato or butternut squash puree as well. Applesauce may be another option for you. 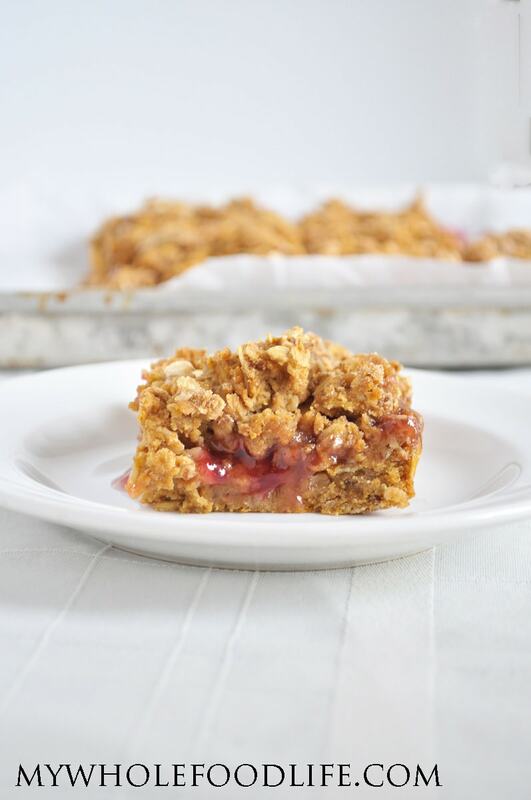 Pumpkin Oat Crumb Bars with a layer of raspberry jam. Heavenly! A must try for pumpkin lovers! Press 1/2 the mixture into the bottom of the baking dish . Spread the jam layer on top. I cut mine into bars with a pizza cutter . Melissa this looks seriously delish! Love the ingredients too! What an awesome use of chia jam (raspberry is my favorite!). Thanks for sharing. What recipe group are you in on Facebook? Thank you! I started a Facebook group for my readers and I to interact. Since Facebook seems to be shutting down reach on pages lately. So I mostly share my recipes and there are also people asking healthy living questions. It's called My Whole Food Life Recipes. I am in the 1% that doesn't like pumpkin is there anything I can substitute for the pumpkin puree? I used Whole Wheat Four and they are very delicious. Yum Thanks! Thanks for letting me know it worked with whole wheat! Can I use spelt flour? That's all I have at the moment. I make Oatmeal Bars w/ fruit on a regular basis. In fact, I am posting the recipe on my blog soon, but I've never made them with pumpkin. Brilliant! Thanks so much. Pinning to my Pumpkin and Dessert boards so I can make them soon. Thanks so much for sharing this recipe with us, Melissa. Pumpkin and raspberry sounds like a wonderful combination! A little savory and a little tart. I'm putting these on my list of things to bake. Thank you! Thanks Linda! I hope you enjoy them! Would brown rice flour work? It might. It might be a little gritty in texture if you use brown rice flour on it's own. Melissa you've done it again!!!! I did this exact recipe but used all natural raspberry jam instead of making my own (too lazy haha). Love these! They resemble the pop tarts with pumpkin filling. Thanks for sharing! Yay! So glad you liked them Stephanie! I made these, but used blackberry chia jam instead since I had blackberries to use up. I followed the recipe exactly, but my bars turned out grainy/gritty and very, very dry. They did not look like the moist picture posted. Do you have any suggestions for why mine turned out not as good as I was hoping? Was I supposed to melt the coconut oil before adding it to the wet ingredients? Should I add more pumpkin? Thanks! I always measure my coconut oil after melting. I am sorry they didn't turn out for you. :( I an guessing that may be why? When I make these again, I will melt the coconut oil first! I'm a newbie with using coconut oil in my baking, so I'm learning new things every day. Thanks for the feedback! You're welcome! I really feel bad they didn't turn out for you. I made these again this morning and made sure to melt the coconut oil before measuring and adding to wet ingredients. SUCH a difference! These were fabulous! Thanks again. Oh yay!! Thanks for letting me know Eva! Hello Melissa! I was looking for a recipe that would allow me to experiment with my oat flour, leftover pumpkin purée, and the ridiculous supply of raspberries in my refrigerator. I've never used oat flour before, but I'm trying out alternative ingredients to make healthier choices. Speaking of which, I made this recipe with a few substitutions... I added an extra 1/4 cup of pumpkin purée in place of oil 1/2 cup of cinnamon applesauce in place of two eggs 1 1/2 cup oat flour 1 1/2 cup of fresh berries (raspberries, blackberries, and blueberries) Pumpkin pie filling in exchange for pumpkin purée -- I had extra pumpkin pie filling and I didn't want it to go to waste. Squeezed 1/2 lemon for juice I baked it in a circular pan and cut it into around 10-12 slices and froze them after they cooled. The oats + oat flour add for a subtle sweetness (albeit denser) finished product but it tastes great the following day! Loved your recipe and I will be pinning it!